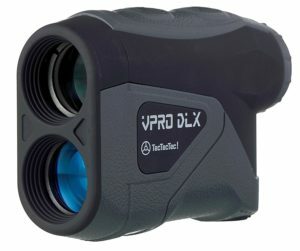 One of TecTecTec’s more recent entries in the mid-range golf rangefinder market, the TecTecTec VPRODLX comes with impressive build quality and reliable operation, offering great performance for those who don’t want to spend too much on their first purchase, while still maintaining an adequate level of quality. The device works at ranges from 5 to 600 yards and has advanced capabilities for detecting obstacles that are too close to each other. It additionally offers extra precision in measuring the distance to your current target and can be particularly suitable for more difficult golf courses with a greater variety of obstacles of different sizes. The optics are great as well, with 6x zoom built right into the device and several layers of coating that make your image clearer and more readable. The TecTecTec VPRODLX is one of the best rangefinders on the market when it comes to challenging lighting conditions and other situations that require a more processed view, although of course you shouldn’t expect miracles, and if you’re in an environment with limited lighting, for example, you might need to use additional tools to get better readings. Included in the package is a full range of extra accessories – a bag for carrying the device (with a strap for carrying it over your shoulder), a battery, and a cloth for cleaning the lenses. We recommend using the provided cloth exclusively, unless you have alternative (but still high-quality) microfiber cloths available, as even a minor scratch can degrade the capabilities of the device significantly. Last but definitely not least, the TecTecTec VPRODLX is one of the better rangefinders when you need to use your device in harsher conditions, such as a golf course with lots of lakes. The waterproof build of the whole body will ensure that you never have to worry about destroying your rangefinder from one drop in the wrong place, and it additionally provides extra durability against minor hits and other types of physical damage.